We had a pretty decent turnout for a warm afternoon. It helps that there was sunshine yesterday as well. There was a certain amount of confusion as to which Lucky Lab was the right one, but eventually 10 people showed up. We played one bracket, single elimination, and one round robin tournament. It almost sort of worked. I wonder if a double elimination wouldn’t have been better, but what’s done is done. If there had been more people or 2 fewer, I think the bracket would have been a little smoother. But live and learn – best alternative. Bryan walked away with the win in the main bracket, with newcomer Courtney taking second place. Hopefully we’ll see her and Justin again next time as well – a little bit of beginner’s luck to keep people coming back and all that. In the round robin, Paul and Martin ended up tying with 12 games each, and so split the prize there, minimal though it was. I’m showing it here from my side of the board – Gints is red, facing the cube. What’s the play? I’ll tell you it was a good double, and I knew it right away because he had to stop and think for a bit. Evaluation from both GnuBG and XG say it’s a double. I’m up 61 pips in the race, and likely to get a better position with my next roll. But I do have 3 men back, and no outfield coverage. As it happened, Gints took, and that is the correct action – barely (for me). XG says if my checker on 23 was on 24 instead, that this is a no double/take position. 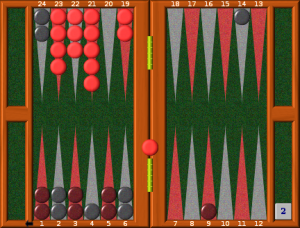 In fact, I managed to pull off my 30% gammon chance, which took us from 1-each to me winning the match. But Gints was right to take, and so that’s the important thing. 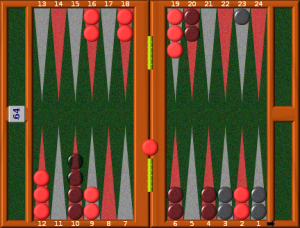 In my last game with Paul, we got to the following position, with him leading 3 to 2 in our match to 5. In the game, I redoubled. Risky play, or sensible? Paul took – smart, or overly optimistic? Overall, I believe a good time was had by all. We’ll try another location next month, when we go back to the actual second Sunday of the month on June 10th – maybe somewhere with a good happy hour. See you there!